Det kostar 100 kr /gång. Jammet som följer ingår för dig som går kursen. I´m interested in our body´s innate ability to respond physically to the environment and it´s ability to trust it´s own physical intelligence. Our body creates space and it is space, and it´s constantly be-coming while extending its skin out in space. How can this notion of constant becoming and bodily readiness be a motivation for movement? With a sense of subtle readiness and playfulness, we will in physical contact with other moving bodies meet the moment with our senses open. We will allow ourselves to move spherical with a clear powerful connection from center to extremities. For the lunch break you can bring your own food, or buy some sandwiches not so far from the venue. 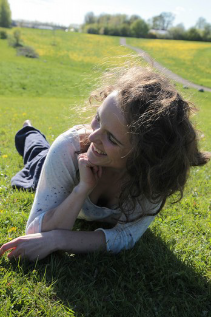 On Sunday 7 oct right after the workshop there is a jam for everyone with Dorte as warm-up facilitator. Warm up 16-17, jam 17-19. The workshop will take place at Kompani 415, Marketenterivägen 1, 415 28 Göteborg. Car: Free parking right in front of the building. To reserve your place, please first contact the Göteborg contact collective at gbg.cic@gmail.com. Bank: SEB (Skandinaviska Enskilda Banken). Don’t forget to put your name and what the payment is for (“WS Dorte” for example) in the payment reference. Registration deadline: 3 October. 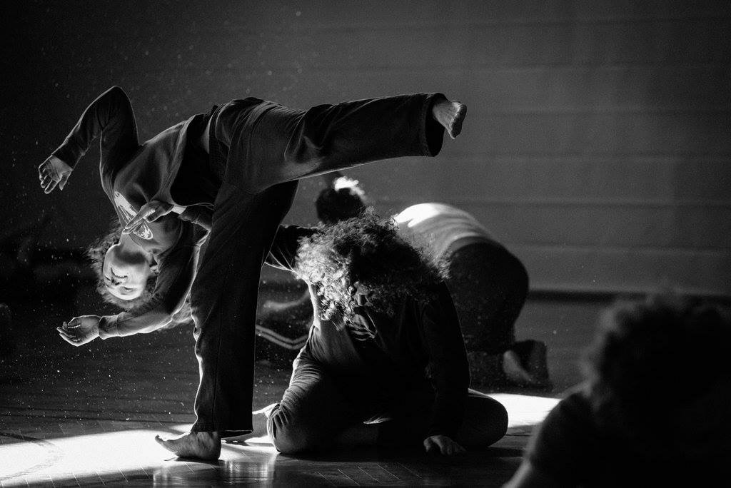 In this workshop, we engage with Contact Improvisation (CI) essentials, with a focus on efficient use of technical skills, to improvise in duo, trio, and more. This promotes ease in changing physical states and levels of touch and weight. We will work with strategies for moving “out of the box” of the duet form, and also for re-inventing what a CI dance might look and feel like. In each moment of an improvised dance there are myriads of possibilities. When we cultivate a relaxed and focused presence, we can expand the range of choices, and continuously stay “out of the box” of expectation. Come prepared for focused playfulness within committed practice. Katarina Eriksson has been involved with improvisational dance since 1989. She teaches Contact Improvisation and other improvisational forms internationally, and since 2000 she curates the performance series Moments Notice in Berkeley. Katarina has worked at The Gothenburg State Theater and Opera, as well as with numerous choreographers and dance companies in Sweden. Some more recent performance work in US includes an art residency with Cathie Caraker atCounterPULSE, clowning at Theater of Yugen, and co-creation with veterans of war with Echo Theater Suitcase. She regularly performs in Sweden/Europe with long-time collaborator Bronja Novak Lindblad and others. Katarina’s teaching supports collaboration, diversity of expression, and “beginner’s mind. Her main guides in art making are vulnerability, musicality and deep play. Ray Chung is a performer, teacher, engineer, and artist who has a passion for dancing which he likes to share with other people. His main focus is improvisation and he has worked with Contact Improvisation since 1979 as part of improvisational performance practice and integrates other movement forms into his work, including martial arts, bodywork and Authentic Movement. Ray has worked with the leading proponents of Contact Improvisation including Nancy Stark Smith, Steve Paxton, Nita Little, Lisa Nelson, Peter Bingham, Chris Aiken, Andrew Harwood, and regularly collaborates with dancers, musicians, and other artists. His work has been featured at numerous national and international festivals and venues. We’ll have an hour lunch at around 1:00 pm. For the lunch break you can bring your own food (there is microwave), or buy some sandwiches not so far from the venue. Don’t forget to put your name and what the payment is for (“WS Augusti” for example) in the payment reference. Registration deadline: 8 August. This workshop is held by Daniel Mang and is not organised by KI gbg. In this workshop we will work with the fundamentals of contact improvisation, such as: the relation to gravity, the physical contact between movers, the momentum of bodies, modulating tone, waking up reflexes and sense of balance, sharing weight. And we will look at ways of combining contact improvisation with bodywork, by which I mean any technique where one person gives therapeutic touch and the other receives. It includes massage but is a broader term that encompasses many different kinds of hands-on work with another person. This workshop will be about listening with your skin; speaking through your body; negotiating boundaries; differentiating qualities of touch; altering the map of the body; creating new meanings for touch, movement, gesture. To this end, we will refine our perception of inner space and body rhythms, as well as our outer sensory/spatial awareness. We will explore touch and movement as relational practices: bonding and bounding, consent and collaboration, safer spaces and negotiation will be some of our themes. All levels of experience and all kinds of bodies are welcome. 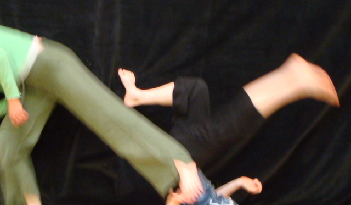 Contact improvisation has been my primary movement practice since 1986. I also practice aikido and am strongly influenced by the Feldenkrais method, Body Mind Centering and ideokinesis. My teaching is informed by my background as a professional bodyworker / physiotherapist, my studies in osteopathy, my experience with different approaches to communication, and by my politics. I see my interest in radical social theory and my love of contact improvisation as two aspects of the same desire. I have been teaching the form since 1990. SEK 300 – 900 on a sliding scale according to your income. For example, if you are unemployed and are just about making ends meet, pay 300; if you have a job but it’s not well paid, or part-time, pay 600; if you have a decent income, pay 900. Danskompaniet Spinn’s Studio, Järntorget 7, 413 04 Göteborg. Don’t forget to put your name and what the payment is for (“WS 17-18 March 18”) in the payment reference. Det kostar 150 kr /gång. Jammet som följer ingår för dig som går kursen.